With the present concern about nuclear radiation, especially since the Chernobyl disaster and the sinking of a nuclear submarine, it is not surprising that many people have been trying to obtain Geiger counters or other radiation monitoring devices. Sales of portable detectors have increased and ETI and other magazines have received countless requests for information on radiation measurement and reprints of past articles describing detecting equipment. 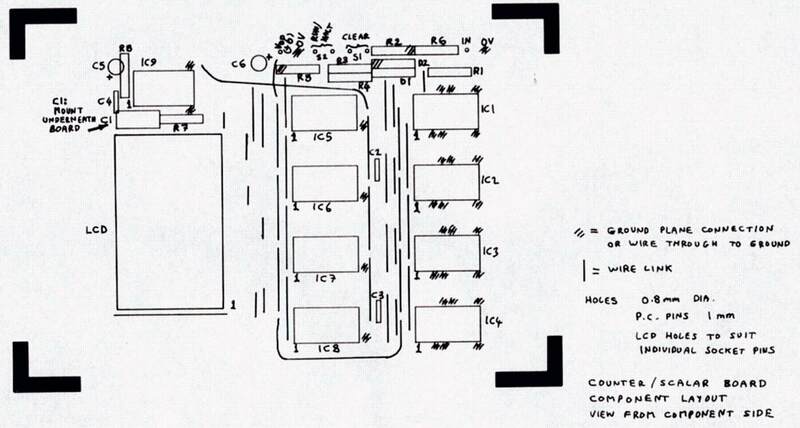 We published a basic circuit for a Geiger ratemeter soon after the Chernobyl accident (see p.17, ETI July 1986). Since then several other journals have published ratemeter designs of various levels of sophistication. The design presented here is the result of a considerable period of development and offers excellent performance and versatility at low cost. It consists of two units, a self-contained Geiger ratemeter and a separate pulse counter which plugs into the ratemeter and uses the same detection circuitry. On its own, the ratemeter is a compact, lightweight instrument which can be used to determine the approximate level of radioactivity being emitted from a source. This is adequate for most practical measurements, but where small changes in background radiation are being compared the accuracy provided by a meter display may not be good enough. Using the counter as well, it is possible to record the total number of pulses detected over long periods of time and so make accurate comparisons. The ratemeter has three count ranges, from 18mR/h (milliRem/hour) FSD up to 2.5R/h (Rem/hour) FSD. A loudspeaker is provided to give an audible indication of count rate (the traditional 'click-click' sound). The detector is a Geiger-Muller tube which is housed in a small plastic case and which attaches to the ratemeter by means of a length of cable and a plug. The unit is powered by four 1.5V cells and the circuit has been carefully designed to ensure as low a current consumption as possible, allowing the ratemeter to be used 'in the field' for long periods of time [i.e. approaching the shelf life of the battery]. Please note that, due to the age of this article, some of the components and/or their suppliers may no longer exist and it may be necessary to seek alternatives. 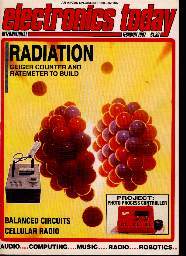 For your own safety, I do not recommend that anyone attempting to construct a Geiger counter should attempt to obtain radioactive materials. However, the staff of a school or college may be able to assist with testing under suitable conditions of safety and supervision. 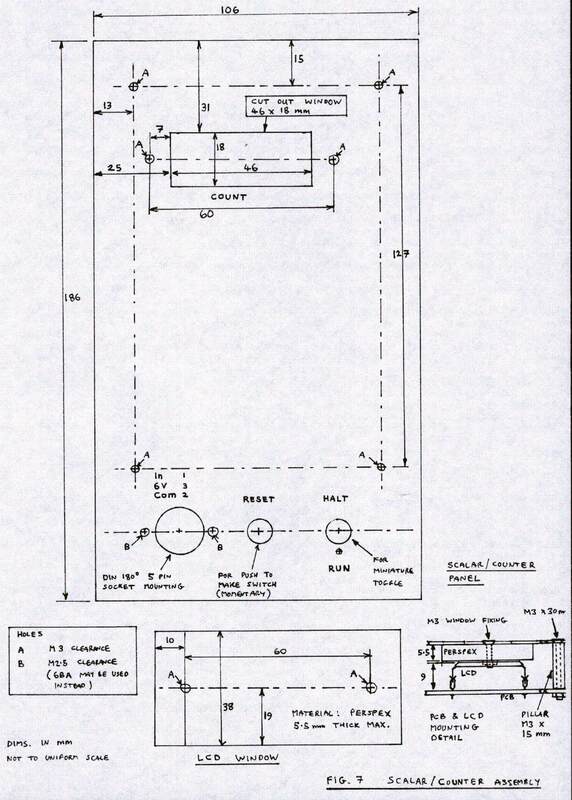 The Geiger counter described here was designed shortly after Chernobyl and is intended for checking for the presence of general radiation levels above background radiation. It could be used for checking food ( e.g. lamb chops) or for checking surplus equipment originating from laboratories that might use radioisotopes (for one's peace of mind). It could also be used for educational lab experiments. Radiation detectors have been around since the turn of the century. Rutherford used zinc sulphide screens to detect radiation by scintillation (emission of light after absorbing radiation). Early on, Rutherford and Geiger experimented with the gas multiplication principle used in Geiger-Muller tubes (2). By 1958, transistorised radiation detectors were being used (3). Portable radiation detectors are usually capable of detecting 3 main types of radiation: alpha particles (helium nuclei), beta particles ( high energy electrons) and gamma rays (high energy electromagnetic radiation). Often they are restricted to beta/gamma or sometimes just gamma detection. The cheapest commercial types, under £100, are simply alarms which trigger a bleeper as the radiation level rises, or bleep at a rate related to the radiation level. Other types are available, such as film badges, which contain a piece of radiation sensitive film which is developed to find out the accumulated dose. Detectors based on charged fibres, which lose their charge as a result of exposure to ionising radiation, give an accumulated dose reading via a small needle on a scale. These cheaper dose indicators are well suited to checking a person's exposure in a hazardous job, but for checking objects for contamination or small increases over background radiation levels, a Geiger-Muller tube monitor gives an immediate indication and the pulses it generates can be counted over a long period of time to compare small increases over the normal background level. Commercial Geiger counters which give an audible output and a meter reading usually cost several hundred pounds (and require accurate calibration and certification of accuracy for professional health and safety monitoring). Their easy application, reliability and simplicity make them a popular choice. The Geiger counter described here can be made for under £100 and gives an audible output, a meter dose rate reading, and counts detected pulses so that small increases in radiation can be detected. It can be used for general detection of radioactivity relative to background radiation. All matter is built up from about 92 naturally occurring atoms which combine in various numbers and types in a unique way in each different material substance. Atoms consist of clouds of negatively charged electrons circling a positively charged nucleus, much smaller than the atom itself, in turn consisting of protons and neutrons. The protons have positive charges and their number matches the number of electrons exactly (in a stable non-charged atom). The neutrons (to put it in a simplified way) make the protons, which repel each other, stick together, and must be present in the right numbers to make a stable atom. The number of protons, the atomic number, determines the element (i.e. 1: hydrogen, 2: helium, 26: iron etc.) and the number of protons plus neutrons, the atomic weight, can vary for the same element, but generally the numbers of protons and neutrons are about the same, with slightly fewer neutrons than protons as the atoms get heavier. The atomic weight can vary for the same element, the different atomic weight versions are known as isotopes of the element. Stable atoms can have more than 1 stable isotope (i.e. non radioactive ones). Most of the feasible atomic constructions are unstable and will break up or decay by emitting nuclear particles and turning into other atoms. This process may be repeated until a stable element is created. In this way, most of the unstable atoms which may have existed have vanished, and only very long-lasting ones, e.g. potassium-40 and the isotopes of lead and heavier elements up to uranium remain. There also exist shorter lived isotopes which result from the decay of uranium and thorium. The common types of radiation are alpha, beta and gamma radiation. Alpha is the equivalent of a helium nucleus, 2 protons and 2 neutrons, travelling at great velocity. It penetrates matter relatively little; a sheet of paper will stop it. Beta is equivalent to an electron travelling at great speed with high energy. Its mass is 1/1837 of the proton and can be stopped by a few mm of aluminium. Gamma is a form of electromagnetic radiation, of wavelength 1 Million to 100 Million times smaller than light. The energy of such radiation is very high, and it is usually emitted along with alpha or beta as a secondary effect of the nucleus being left in an excited (high energy) state. It is very penetrating and requires at least 5 cm of lead to reduce the gamma radiation to 1/10 of the unshielded level. Measurement of radiation is highly important to providing radiation protection (6,7), and involves many complexities which are not mentioned here. The measurement of radiation level is commonly done in terms of the absorbed dose. This is a ratio of the absorbed energy in a volume of matter to the mass of the matter. Hence 1 Gy (Gray) is the unit equivalent to 1 Joule absorbed per kg. These recently introduced SI units are being brought into use; however, the old units still appear on instruments and will remain in use alongside the new ones, and are also used on this Geiger Counter. The old unit of 1 Rad is 0.01 Joule absorbed per kg (See table 1). The types of radiation have different effects on living tissue, depending on the range of absorption. Alpha rays do not penetrate outer layers of skin, but if an alpha emitting substance is inside the body, the energy is dissipated in a small area, causing great damage to cells. Beta and gamma rays however are absorbed over a longer distance and are less damaging to individual cells. Hence to take account of this, the unit of radiation dose which produces constant damage regardless of the type of radiation (the dose equivalent) is the Sv (Sievert) which is equal to the dose in Gy multiplied by a relative biological effectiveness factor Q. This factor is 1 for beta and gamma, and 20 for alpha rays. Another multiplier N may be defined in the future. Dose level limits may therefore be specified in Sv/hr, or Rem/hr, whereas a counter may measure the rate in Gy/hr or Rad/hr. (for other units see below). 1 Ci (Curie)	= 3.7 x 10^l0 nuclear disintegrations per second. 1 Bq (Becquerel) = 1 nuclear disintegration per second. 1 R (Rad) = 0.01 Joules per kilogram of absorbing material. 1 Gy (Gray)	= 1 Joule per kilogram of absorbing material. ( the absorbing material must be specified). Q = 20 for alpha particles (formerly 10). There is a background of natural radiation always present, which is caused mostly by natural radioactive isotopes in the environment and cosmic radiation. This is around 100 mRem/year in Great Britain, although can be thousands of mRem/year in some parts of the world. Table 2 lists radiation levels recorded from various sources, using the Geiger Counter. The radioactive constituents are indicated where possible. The Geiger-Muller tube has always been popular because of its availability in small portable units, cheapness, reliability and easy interfacing. One of their great advantages is that, due to the internal gas avalanche multiplication, output signals are high. Their main disadvantages are insensitivity to gamma radiation and, since the output pulses are always the same avalanche multiplied level, they cannot discriminate between radiations of different energies. Radiation can be detected by the ionization it causes when it interacts with matter. The energy of the radiation removes electrons from atoms creating charged particles. An electric field can be used to collect the ions, causing current to be detected by instrumentation. Ionisation chambers use this effect directly (one such reported demonstration instrument consisting of knife and a fork separated by a small air gap), but produce small output signals. If the electric field is increased, the ions accelerated by the field gain enough energy to ionise more gas atoms in collisions. This results in an avalanche of electrons and so-called gas amplification of the original ion pulse. 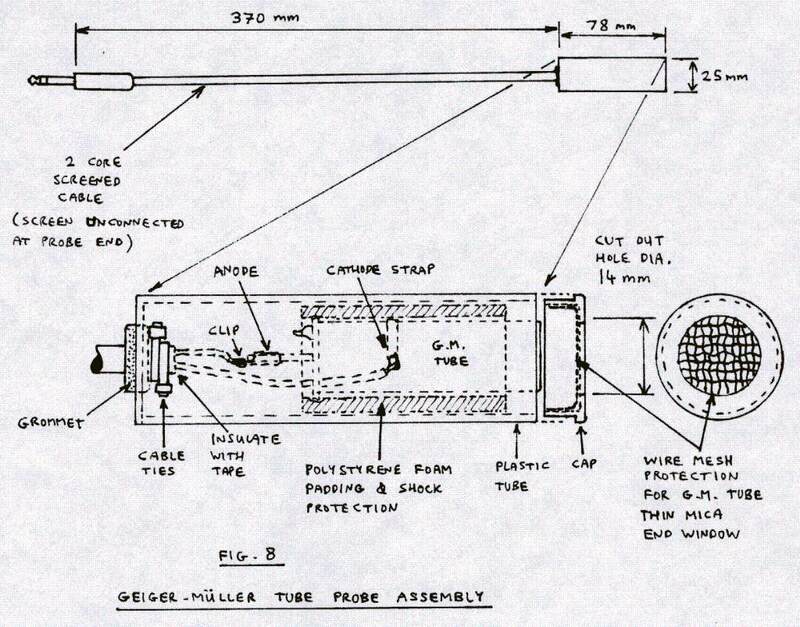 The Geiger-Muller tube (Fig. 1) is constructed with a wire anode concentric with a metal (e.g. iron) cylinder, filled with gas at less than atmospheric pressure. The field around the anode wire is very high and avalanching takes place around it. Ultraviolet photons are created which cause spread of avalanche by the photoelectric emission of electrons. In order to prevent repeated avalanching when the slower positive ions reach the cathode and knock out secondary electrons, a quenching method is used. The Mullard ZP1400 GM Tube has a halogen gas content which absorbs the energy from the positive ions, preventing further avalanche. 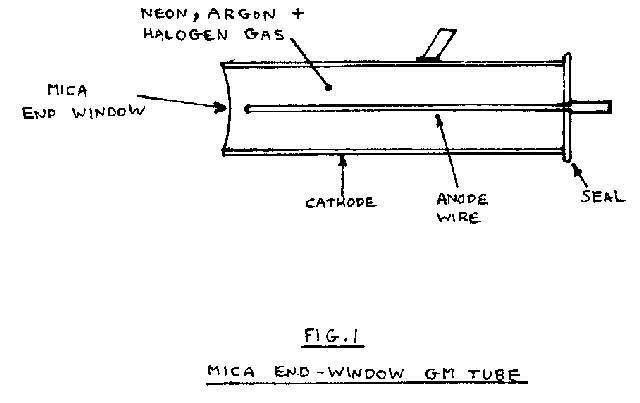 The mica end window, which is very thin and bows inward due to the reduced pressure inside the tube, allows the beta radiation to enter the tube. If sufficiently thin, alpha particles are also admitted. A special tube (e.g. Mullard ZP1401) is specified with a thinner window when alpha particles must be detected. Gamma rays are detected in the gas, and by scattering electrons out of the cathode material into the gas. Other ionising radiations may also be detected. The GM tube requires a 500 V supply for operation; this is generated by a switching power supply from the 6V battery line. Fortunately the current drawn by the tube is a few microamps so very little power needs to be generated. To minimise battery drain, the transformer is driven with short pulses at long intervals, which cause the transformer to generate a characteristic exponentially decaying 'ring'. The stage using TR1 and TR2 (Fig. 2) is an astable pulse generator. TR3 amplifies and further shortens the pulse and TR4 drives the transformer. The stepped up output voltage from the transformer is further increased by the voltage doubling circuit, developing the bias for the GM Tube. Radiation causes output pulses to appear across the GM Tube when the gas around the anode becomes ionised. The pulse has a rapid rise, and a slower decay caused by the stray capacitance in the circuit. TR5 squares the pulse and TR6 further squares and amplifies the signal. The output of TR6 drives the display and output circuits, and is also coupled to TR4, the HT driver stage. 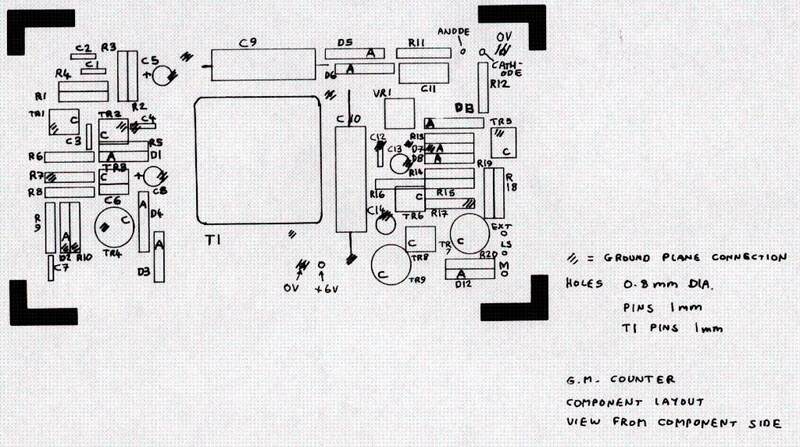 This feedback causes each GM pulse to provide additional HT drive. Consequently, the output of the GM bias supply is maintained when the GM tube current drain increases due to ionisation by radiation. This method has been used successfully in other designs without any oscillator, relying on the background counts to drive the HT generator. However, if there were no charge on the HT capacitors, the supply would have had to be primed to start it up. Hence the provision of an 'idling' oscillator (TR1, 2). Each pulse is made audible by TR7 stage which drives a short current pulse through a miniature loudspeaker. The clicking gives a satisfying 'authentic' direct indication that the GM tube is detecting background radiation, and an immediate indication when radiation increases (small personal radiation monitors use a bleep circuit because the clicks contain mostly high frequency components which are not so effective in noisy environments). The current amplifier TR8, 9 charges capacitors for a ratemeter display. Each pulse, approx. 120 mA in the most sensitive range, adds to the charge on a capacitor which leaks away through the indicating meter. The meter gives a reading proportional to the rate of pulses, in switched ranges of different sensitivity. The capacitance helps to smooth out the variations caused by the random arrival of pulses, especially at low levels. The output pulse is also made available to external circuitry, such as the scalar/counter, together with the supply voltage, on a socket. The HT supply and output circuits take large current pulses from the supply. However, the duty cycle is very low over the normal range of operation, so that the standing current drain is very low. Capacitive decoupling of the supply prevents malfunction due to the current spikes. Current drain is 0.62 mA with normal background radiation, rising to a few mA on exposure to radiation sources. The range switch S1 also acts as an on-off switch for the battery. Due to the low current drain, the unit can be left on to monitor for long periods. A further position on the switch is used for battery checking (Fig. 3). No ICs are used in the detector unit as (a) there is not much need for them and (b) discrete transistors are more resistant to damage by radiation than ICs (not that the user is likely to encounter such levels of radiation, hopefully). TR1 and 2 are a conventional astable multivibrator with asymmetrical time periods. C3 shortens the pulse which is squared and amplified by TR3, Dl being a Vbe breakdown preventer. C6/R8 shortens the pulse further to about 25 us. TR4 drives the primary of T1, the current being mainly limited by the inductance of the primary. To provide sufficient inductance a pot core with a high Al was used in the prototype (Mullard FX2241). The Al value quoted is 5815, for Al3 ferrite. The core must be large enough for the large number of insulated-layer secondary turns (30 mm dia.). Due to the large step-up ratio about 250 V peak to peak is developed in the secondary and appears across C9 and D5. Voltage stabilisation is achieved by the flyback limiting action of Zener diode D4 and rectifier D3. Voltage doubling occurs as the C9 voltage is added to that rectified by D6 and so 500 V appears across C10. These capacitors are generously rated for reliability and must have very low leakage. R11 limits the GM tube current as specified by the data sheet. C11 helps to shorten the decay of the pulse (it is possible to omit C11). The decay time of the pulse is dependent on the capacitance of the cable connecting the GM tube to SK1. R12/VR1 attenuate the approx. 100 V peak pulse and set the level for the pulse squaring stage TR5, such that the pulse length is 25 us. D7 prevents Vbe breakdown and D8 prevents Vcb breakdown, in the vicinity of the 100 V pulse, and D8 also limits charge storage (it must be a germanium or Schottky type to do this). D13 raises the threshold voltage to a convenient level. TR6 further amplifies the pulse and enables the distribution of a CMOS compatible signal to the external socket, the HT feedback input at C7, the loudspeaker driver TR7 and the meter driver TR8/9. D12 prevents Vbe breakdown in TR9. R21-23 are switched to change meter sensitivity. R24 plus the meter resistance (300 ohms) should be a total of 1 kohm (to within about 2%) to make a 1V FSD meter, at 1mA full load. Use of a meter with a different resistance would require R24 to be changed accordingly. D9, 10, 11 protect the meter from surges. C16 is additional smoothing capacity switched in on the lowest count rate range. Measurement of low radiation levels close to background level is difficult because of the random and intermittent arrival of pulses, about 25 a minute, which just deflects the ratemeter needle on range 1. Also at low count rates, sufficient numbers of counts are required to reduce statistical variations in the average count rate. To average out the fluctuations it is necessary to count the pulses over a period of say 30 minutes and compare the rate with a previously established background level. A portable counter was designed, using CMOS ICs and LCD display for minimum power consumption (Fig. 4). This MSI solution should have better resistance to radiation damage than an LSI counter module; the price difference is not great but the LSI chips available would of course make a smaller unit. The circuit is designed to drive an Epson LD-H7916 AZ LCD and there are other compatible makes such as the Hitachi H1333CC. 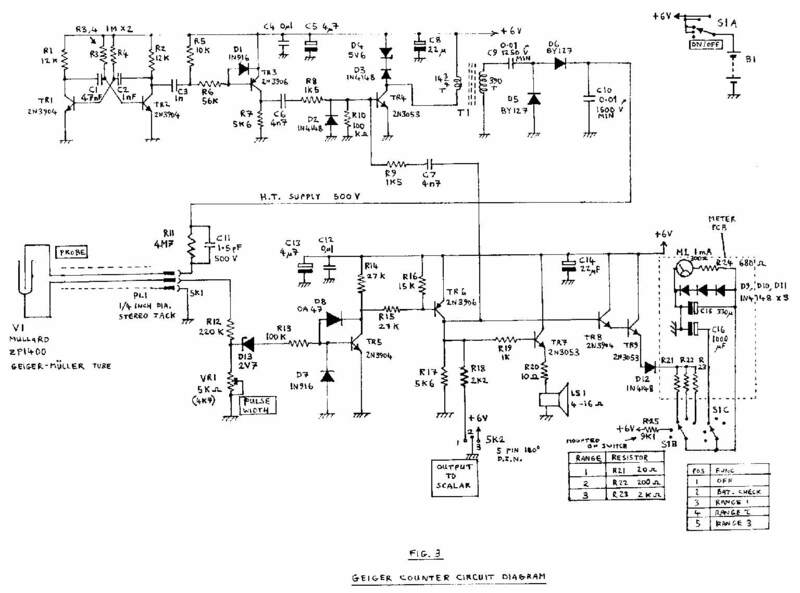 The circuit uses about 0.1 mA derived from the Geiger Counter external socket at 6 +/- 1 V. The scalar input, protected by R1, Dl, D2, is the count input to a 4 stage BCD counter, IC1 to IC4. The PL inputs are switched by S1 to provide a clear to zero button. IC5 to 8 generate the LCD drive signals from the BCD digits and from a 70 Hz square wave from the astable IC9. IC9 also provides the backplane/common signal for the LCD. S2 controls the LD inputs of IC5 to 8 (latched inputs) so that in COUNT, the counter value is displayed and updated, and in HALT, the display is frozen while the counter continues to be updated. Note that if switched on when in Halt mode a meaningless pattern will be displayed. 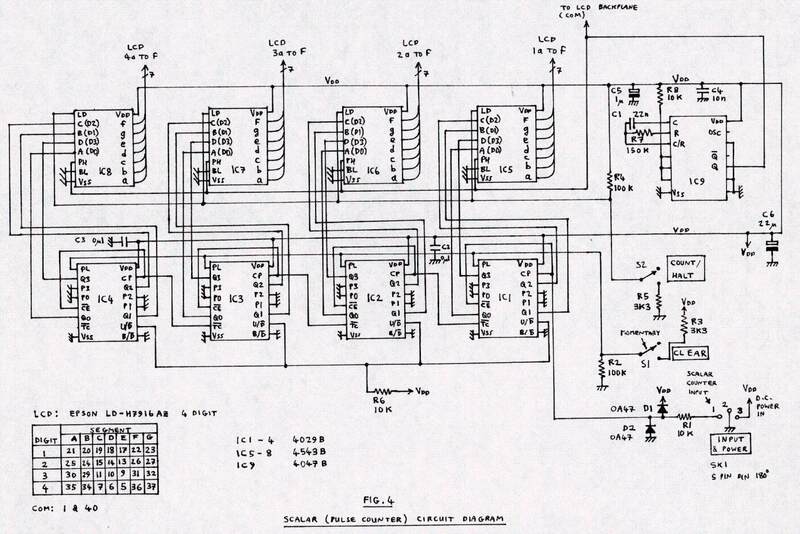 This counter will count at a rate up to a few hundred kHz, and requires a CMOS compatible input switching from approx. 0.5 V to Vcc-0.5 V. Since the display is a 4 digit, the count limit is 9999. Constructional dimensions are given as a guide because constructors are likely to be using parts of differing dimensions and will need to adapt the design to available parts. For instance, boxes of different make might be used, and loudspeakers vary in dimensions and mounting. The meter used was an ex-equipment type. Costs may be significantly reduced by making use of surplus or ex-equipment parts (See Fig. 5). The Geiger counter is housed in a plastic 'Retex Box' 220 x 135 x 75 mm (available in the Edgware Road, London) with an aluminium top panel. The main PCB is mounted vertically in the internal PCB guides. All controls, sockets, meter and loudspeaker are fixed to the aluminium panel, and there are some meter components mounted on a PCB bolted directly to the meter terminals. The battery is a group of 4 R6 (HP7/AA) cells in a short plastic holder (RS 488-179 or Maplin HF29G), which is secured by a pair of cable duct clamps (RS 543-478 26mm x 33mm) which are drilled and screwed to a PCB held by the box guides. This PCB divider is profiled to allow clearance for the loudspeaker and range switch (see Fig. 6). 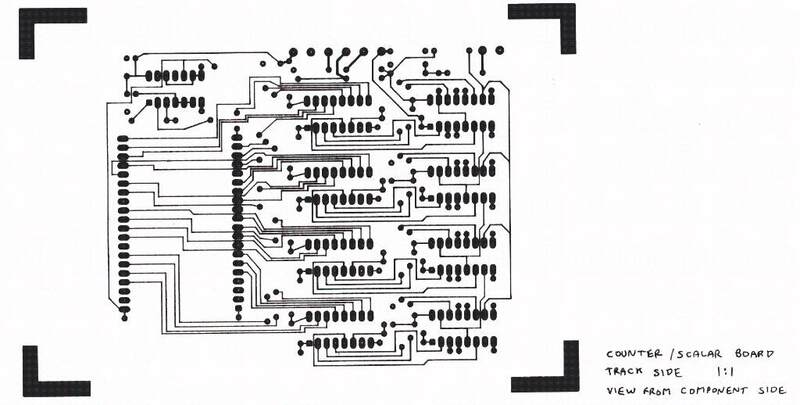 The PCB layouts are for double sided boards with tracks on one side, and components and wire links on the ground plane side. The use of a ground plane is highly recommended for the main Geiger counter board, because this helps to isolate the HT supply pulses from the GM tube pulse amplifier and also reduces radiation of RF interference from the HT supply, and helps to reduce sensitivity to spurious pickup from mobile radio transmitters. etc., which might interfere with the readings. The GM probe cable is also screened for this purpose, and to reduce pulse width variation caused by hand capacity. As for protection against EMP however, this is best assured by packing the equipment in a closed metal box and burying it several feet underground when there is such a risk. Component lead holes should be isolated from the ground plane using a counterbore (RS 349-381) tool or drill. Plenty of clearance to the ground plane should be given around the 500 V HT circuitry. The Geiger counter board should be fibreglass, as any leakage current is liable to excessively load the HT supply. Grounded leads should be soldered to the ground plane. Mark the grounded pads when counterboring and leave these holes non-isolated. In the case of ICs on the scalar/counter, ground pins are taken to separate pads so that a wire link to ground plane can be fitted. Since there is no 0V rail on the layout, a ground plane should be used on all board designs given here. 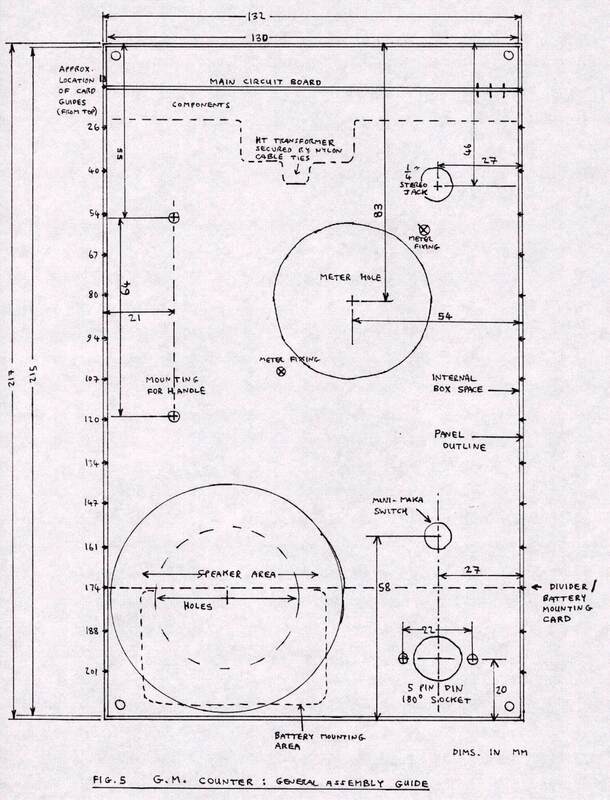 The loudspeaker will require a pattern of holes in the panel - many 3mm dia. holes if a power drill is available, if not, larger holes can be used in fewer numbers. The scalar/counter PCB is mounted on the panel with 15 mm spacers so that the PCB mounted LCD appears behind a protective perspex window (Fig. 7). Use PCB lacquer to protect the copper areas. Soldering iron tinning is not recommended as it may warp the board. The construction of the probe (see Fig. 8) depends on what kind of container is available. A used container will probably be found near enough to the required dimensions from scrap. Plastic containers are recommended with a cap which will enable a disc of fine wire mesh (like the mesh used in a tea strainer) to be cut to shape and inserted to protect the fragile end window of the GM tube. A hole is cut in the cap to enable beta particles and alpha particles (with the ZP1401 tube) to enter the end window. A new GM tube should be purchased to eliminate any doubts about its efficiency. 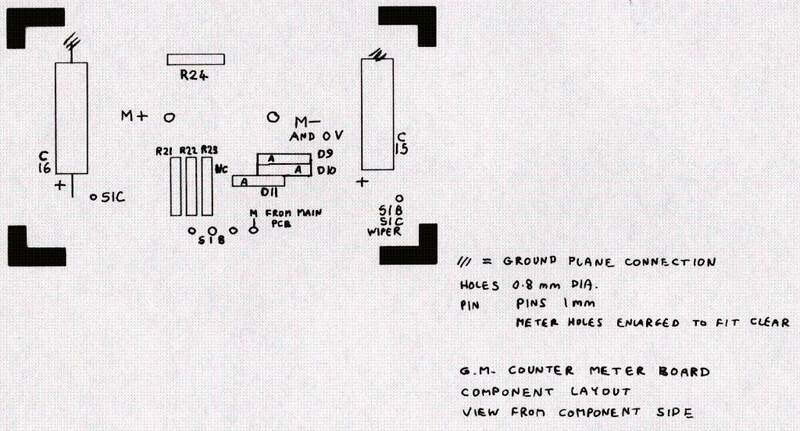 This counter is designed for the Mullard ZP1400 tube, which is a beta and gamma tube, for 0. 1 mR/hr to 1 R/hr dose rate. The plateau threshold voltage (the start of the bias region where a fairly constant count rate is obtained) is 400 V and the plateau length is 200 V. The recommended supply voltage is 500 V (as GM tubes age, the plateau length decreases and spurious counts appear). It has a chrome-iron cathode and a 9mm mica window of area density 2-3 mg/cm^2. Its life expectancy is 5 x 10^10 counts. The similar ZP1401 has a thinner window, to be sensitive to alpha particles (although alpha particles can be detected by the ZP1400 given sufficient energy). 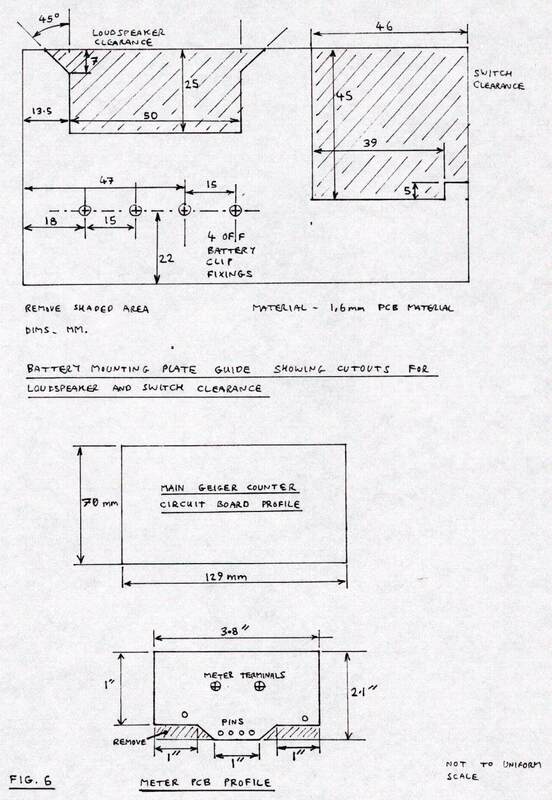 The prices at the time of writing were ZP1400: £37.50 and ZP1401 £40.50 excluding VAT (available from Alrad Instruments Ltd., Turnpike Road Industrial Estate, Newbury, RG13 2N8, Tel. (0636) 30345 ). The GM tube end window is a very thin, fragile, mica disc, which bows inward under pressure due to the low pressure inside. It is liable to be broken by contact. The tube comes fitted with a protective plastic cap, which may be left on until the tube has been wired to the cable, and drawn into the container cushioned in a foam plastic wrapping. The anode pin is connected via a push-on clip which is supplied with the tube. Take care not to touch the end window with the cap or the wire mesh when you fit the cap. Ideally the GM tube should be mounted in low background count materials, but the plastic materials used were found to make no significant difference to background count. The probe assembly should be kept clean and with no solder splashes. The box that the GM tube comes in may be adapted with its foam packing as a storage box for the finished probe. After transfer lettering the panels, the usual laquer can be used or ormoline lacquer carefully brushed on. The GM tube supply voltage should be 500 V +/- 25 V, measured with a 5% instrument. This is achieved by adjusting the primary turns of T1. The secondary of T1 should be wound first, with 42 to 48 SWG enamelled wire, in layers of 50-60 turns and an insulating layer of thin paper or thin plastic tape between each layer, taking care that the ends of the layers are kept insulated. When the required number of secondary turns are fitted (which 390 turns is about as many as can be wound leaving enough space for the primary) the initial primary can be wound using 30 to 38 SWG wire. This will occupy 1 layer. Connect the transformer with some wires, temporarily clamped with its cores. If the circuit waveforms are present as shown, the HT voltage can be checked. This will require an oscilloscope with a 1 V/cm range, 1Mohm input, and a 10 Mohm times 10 probe. A further times 10 probe must be made from two 33 Mohm + one 22 Mohm resistors in series, or one 90 Mohm 500 V resistor. The high impedance enables the oscilloscope to display the voltage when the probe is touched to the HT supply. Nevertheless, because of the low current available, the HT capacitor voltage soon discharges, so the probe must be briefly tapped on the HT output while observing the oscilloscope. The effective multiplication is 100 times, so a 5 cm deflection is required. If the HT voltage is out of the limits, the primary winding must be rewound as follows (hence having the primary wound last). New pri. turns count = Old turns count X ( old HT voltage / 500 ). Next, the trimmer VR1 should be adjusted so that the output pulse at TR6 collector is 25 us wide at 50% peak to peak. This standardises against variations in GM tube load capacitance. Now the ratemeter calibration can be considered. The prototype scale (Fig. 9) was calibrated by setting various count rates using an object with radium paint, and referring the count rate to the dose rate graph given in the GM tube data sheet. A range of points were plotted for range 1, giving a curved graph. The output current characteristic calculated for the output circuit showed a similar curve. The non-linearity (due to non constant charging current) can be fitted to the measurements by establishing a highest reading on each scale, and multiplying the rate by a scale factor for each other current value. On range 2 and 3, extrapolation was necessary due to the undesirability of obtaining more powerful sources. Note that the tube specification is limited to 1 R/hr, whereas Range 3 scale ends at 2.5 R/hr. This method will undoubtedly include sizeable errors. More accurate calibration for a particular counter and probe will require a precise radiation dosimetry set-up with calibrated standard radiation sources, which will only be available to a few specialists. Also, sensitivity can be expected to vary depending on the type of radiation and its energy. However, if the user's main concern is to minimise exposure to radiation then measurements are likely to be relative, and referred to background count anyway. If a piece of meat has twice background radiation then that would probably put you off eating it regardless of what the measured level in Rems is. In any case, many radioactivity experiments can be done using count rates as relative quantities. The GM tube probe is placed near to the object being checked for radiation. Gamma radiation and high energy beta will penetrate the walls of the tube; low energy beta radiation may be detected through the thin end window. Take care not to touch the end window as it is very fragile. High energy alphas may or may not be detected through the window of the ZP1400 tube, but the ZP140l tube with its thinner window is specified to detect alphas. Note that the range of alpha particles is limited to a few cm in air, and the window acts to reduce the effective range. Low energy alphas are not detectable with GM tubes. The range of beta particles is variable, and generally further than alphas, and can penetrate a few mm of aluminium or plastic. Gamma rays are very penetrating, in air they follow the inverse square law which means that the count rate at a distance from a source is inversely proportional to the square of the distance. Consequently one of the best methods of radiation protection is to keep a safe distance away. A stopwatch facility will be required. Zero the counter and start the timer at the same time. After sufficient counts have been taken, stop the stopwatch and set the counter to HALT at the same time; halting the count display. The count rate is then the number of counts divided by the time on the stopwatch; the count rate is the relative measure of the intensity of radiation intercepting the detection volume of the Gm tube. The accumulated dose to a living organism is proportional to the intensity of radiation, the time exposed to that intensity, and the relative biological effectiveness or Q factor defined for the type of radiation. Hence a higher than background level may not be significant if it occurs only over a few minutes, whereas the constant background radiation is giving an accumulating dose continuously. However, low level radionuclides taken into the body can be concentrated in particular organs and in that case any presence of abnormal radionuclides may be harmful (e.g. radium-226 in radium paint which concentrates in bones). Because of the random disintegration of radioactive atoms, the count rate over a fixed time may vary randomly above and below an average. Over a long time period with many counts, the random fluctuations are averaged out. The statistics of radioactive decay can be used to estimate how much error is likely in the reading. If there are enough counts (more than 100) then the 'normal distribution' can be assumed. If the standard deviation of the measurement is known, which is a measure of its variation, the probability of the result falling within a certain number of standard deviations either side of the mean can be found. For radioactive decay the standard deviation of a single count can be expressed as the square root of the count. It happens that about 95 % (95.44%) of the readings will lie within plus or minus 2 standard deviations of the mean, that is, twice the square root of the number of counts. Because of the random fluctuation in count readings, comparison of readings against background counts must bear the error limits in mind. To reduce the error in the background count, the count number must be as high as possible, which means waiting sufficient time for them to accumulate. To get 400 counts with a statistical error of +/- 40 counts might require 20 minutes of counting. You should also bear in mind that the background count varies from place to place and also varies over the course of a day by as much as 30:1 (4, p.405). Therefore, make background readings at the same time as the other test reading. If the test reading is higher than the background, consider the errors. On each reading, there is 2.5% probability of the error exceeding the limit on one side only. If the background plus error is less than the test reading minus error, the chance of there still being an overlap is 2.5% squared which is 0.0625%. Therefore if the test reading is still greater than the background taking into account errors, then that is a 99.9 % probability. If 400 counts are taken and the count rates obtained by dividing each count by the time taken for it, then the test reading rate must be at least 20% higher than the background rate to be clear of the errors. If more counts are taken then the errors can be reduced, and if fewer counts are taken then the errors will be greater. All resistors 0.125 14 or 0.25 W 5%. VR1 5k or 4k7, Allen Bradley type E2B 0.5 W 10%. C9 0.01 uF 1250V min polyester, polyarbonate, polystyrene or mylar. C10 0.01 uF 1250V min polyester, polycarbonate, polystyrene or mylar. C11 1.5	pF 500V min ceramic. D4 Zener 5V6 (BZY88C5V6 or similar). T1 Mullard FX2241 core grade A13 (Al min = 5815), diameter 30mm with clips and tagboard (no trimming core). See text for winding details. Handle: Maplin FG42V, 89 x 38 x 8 mm. 4BA bolt fixing centres 63mm. S1	3 pole 5 way break before make, e.g. Maka Switch assembly using 6 way wafers with limit stop. B1	4 R6 (HP7/AA) in holder (RS 488-179 or Maplin HF29G) secured by 2 cable duct clamps (RS 543-478), plus battery clip. Ml lmA DC fsd meter. LS1 2.5 inch 4-16 ohm loudspeaker. PL1/SK1 0.25 inch stereo jack plug and socket. SK2 5 pin 180 deg. DIN socket. V1	Mullard GM Tube ZP1400 (beta & gamma) or ZP1401 (alpha, beta & gamma) from: Alrad Instruments Ltd., Turnpike Road Industrial Estate, Newbury, RG13 2NS, Tel. (0635) 30345. Probe cable: Twin screened 7/0.2mm 5mm O.D. Box: 'Retex Box' 220 x 135 x 75 mm approx. All resistors 0.125 W or 0.25 W, 5%. C1 22n polycarbonate, polyester, mylar or polystyrene. All capacitors > 10 V.
D1, 2 OA47 or 1N916. ICs	must be mounted in low profile sockets, if used, to enable mounting of LCD behind panel. LCD	Epson LD-H7916AZ (4 digit), from: Midwich Computer Company Ltd., Gilray Road, Diss, Norfolk, IP22 3EU. S1 Momentary action push to make. Individual IC socket pins for mounting LCD (40 pins). SK1 5 pin DIN 180 deg. Box: 'Retex Box' 187 x 106 x 60 mm approx. All PCBs made from 1.6 mm (1/16 inch) double sided fibreglass epoxy. J. Sharpe, "Nuclear Radiation Detectors", Methuen & Co. Ltd., 1965. K. Kandiah, "Nuclear Instruments Over The Last Fifty Years", Journal of Scientific Instruments (Journal of Physics E) Vol. 1 pp. 369-372, 1968. 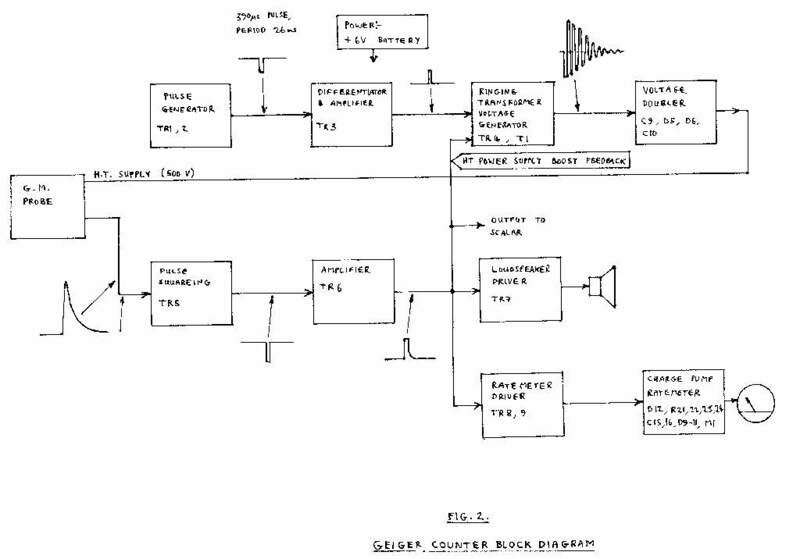 F. S. Goulding, "Transistorized Radiation Monitors", I. R. E. Transactions on Nuclear Science, No. 2, Aug. 1958, Vol. NS-5, pp. 38-43. P.	429: C. J. Borkowski & R. H. Dilworth, "Personal Radiation Monitor', Oak Ridge National Laboratory. P.	497: J. Keller, "A Single Transistor GM Monitor With A Stabilised GM Supply", Instytut Badan Jadrowych, Warsaw. J. N. Andrews & D. J. Hornsey, "Basic Experiments With Radioisotopes", Pitman Publishing, 1972. Alan Martin & Samuel A. Harbison, "An Introduction to Radiation Protection", Chapman and Hall, 3rd edn. 1986. Edward Pochin, "Nuclear Radiation: Risks and benefits", Oxford University Press, 1985. Copyright ©1987, 2002 No portion of this site may be reproduced in any way without express permission of the publisher.